Find crochet patterns for skirts and dresses for special occasions in this amazing collection. 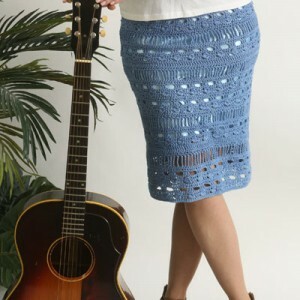 See how you can make your own summertime crochet skirt to pair with an everyday tank top, or learn to crochet dress patterns that you can wear to a barbeque or as a beach coverup. Whatever the occasion, don’t be intimidated! Anyone can crochet skirts and dresses – just follow the pattern and keep your tension consistent. These types of patterns are so easy to customize, too! Use light and lacy yarn for summertime fun, or you can use sparkly yarn to crochet skirts for the holidays! No matter your style, learn how to quickly and easily create the perfect outfits for everyday wear. Whether you’re vacationing along the French Riviera or enjoying an ice cream at the beach, this retro-inspired shift dress will pair perfectly with some sunglasses and a boater hat as you soak up the sun this summer! Inspired by 1950s poodle styles, this layered, above-the-knee skirt sits at your hips and offers a definitive modern twist. Worked in turned rounds and an extended sc, this skirt works up quickly so you’ll have plenty of time to enjoy the season. This simple skirt is solid in color, but chock full of texture! It even features a gorgeous floral motif hemline. 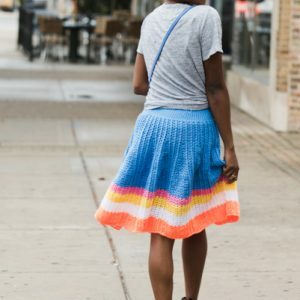 Make it your own by lengthening (or shortening) the skirt to create a unique design that’s perfect for your wardrobe. You’ll love donning this beauty all season long. This bold skirt is made all in one piece for a seamless effect. The possibilities are endless with this skirt pattern in terms of colors and styling. Swing into summer in style with this crochet skirt. This lacy skirt is paired with an optional lightweight lining for a classy look. This skirt is inspired by fresh breezes and blue skies. Made with a lightweight cotton and a flirty swing hem, you’ll love how simple this piece is to layer. Pair it with a cotton skirt or a dress to give it extra flounce.